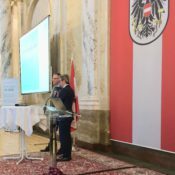 The Forest-based Sector Technology Platform (FTP) launched its Vision 2040, a document in which research and innovation priorities of the forest-based sector are discussed, at a conference organized together with Austrian Presidency of the Council of the European Union, on 20 November 2018, in Vienna. EUSTAFOR’s Executive Director spoke in the panel discussion of this conference along with other FTP stakeholders. 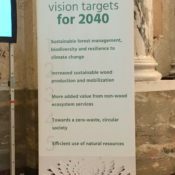 The recently released Vision 2040 sets out 10 targets, of which three deal directly with forests and their sustainable management. 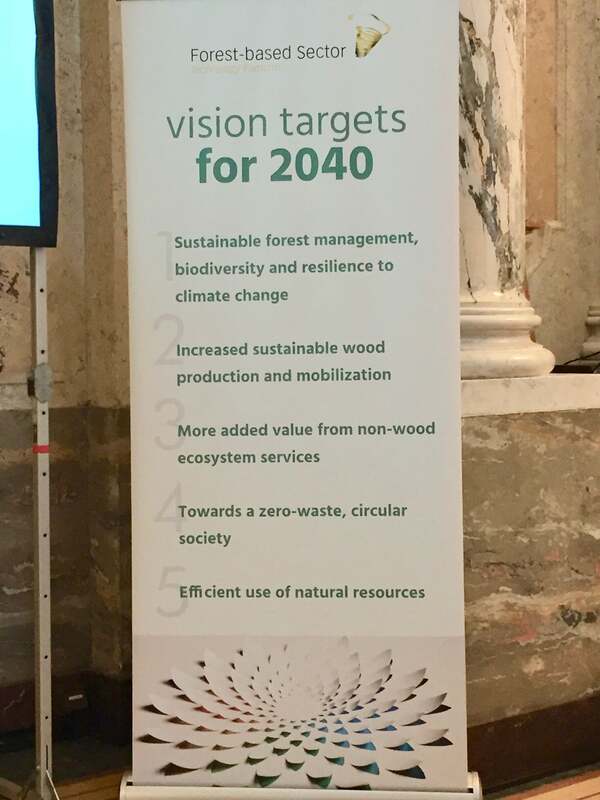 FTP’s Vision 2040 aims to make the forest-based sector even more dynamic and innovative in order to meet the ever-increasing demand for renewable raw materials while at the same time addressing the objectives of the global Agenda 2030 and its Sustainable Development Goals (SDGs) as well as those of the 2015 Paris Agreement and the overall Climate and Energy Policy objectives of the European Union. Since its first Vision was published in 2005, the FTP has played a significant role in creating knowledge, technologies and innovations in the forest-based sector, through Europe-wide collaborations. FTP serves as a platform to bring together stakeholders and policy and decision makers. National Support Groups (NSGs) serve to secure regional support for the platform by coordinating national business, research bodies, authorities and funding agencies. The NSGs participate in the FTP Advisory Committee. The FTP board is comprised of representatives of the industry, the chair of the Advisory Committee, and at least one of FTP’s four shareholders: EUSTAFOR, CEPI, CEPF, CEI-Bois. How to integrate farmers and foresters into bioeconomy value chains? 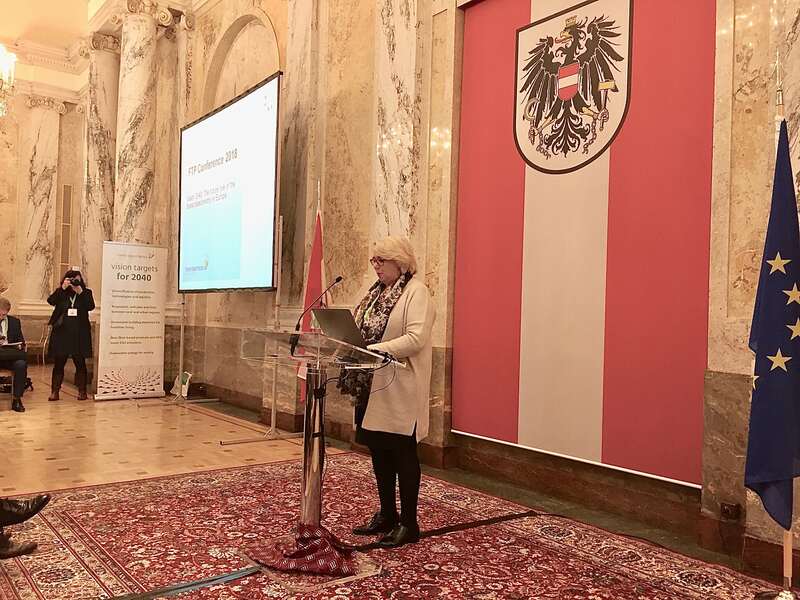 Directorate-General for Agriculture of the European Commission convened a workshop “Best practices for integrating primary producers (farmers and forest owners) in the bioeconomy value chains and boosting the development of the bioeconomy in rural areas“. The workshop, held on 20 – 21 September 2018 in Brussels, discussed the implementation of the National Bioeconomy Strategies (NBSs) in different Member States (MS) and how primary producers can be involved in these processes. EUSTAFOR actively assisted the organizers by collecting foresty case studies. 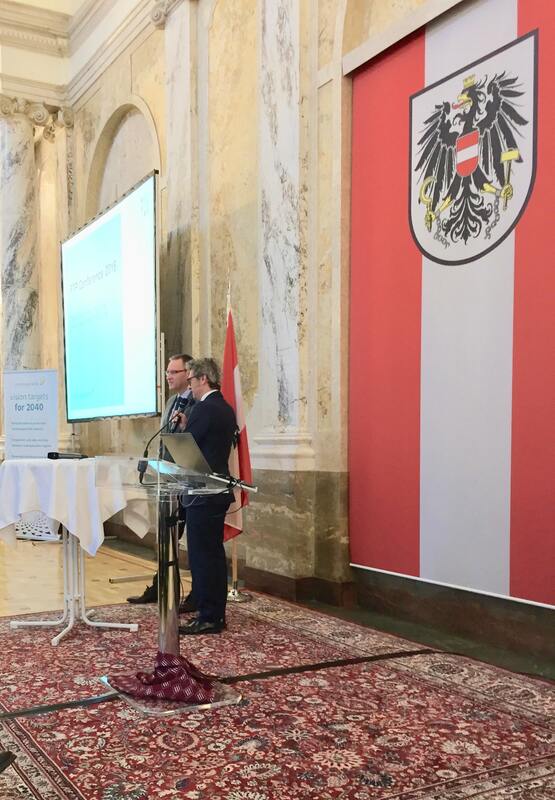 The event provided a good opportunity to present specific national bioeconomy cases. For the forest sector, Mr. Gustav Tibblin (SODRA) presented the case of a specific business model on how to involve private forest owners in the bioeconomy. Sodra is a forest owner cooperative, which brings together more than 51,000 members – mostly small farmers, who gain additional income from participating in the bioeconomy chain. Each member holds one share and once a year half of the co-operative’s profits are paid as dividends to the owners. Mr. Jan Wintzell (Sveaskog) explained a production chain of biofuels from tall oil. The case of the company SunPine, owned by 5 shareholders, was presented. The first investment in bio-fuel production (2006) was financially risky because it was not clear if the investment would pay off. In this context Mr. Wintzell pointed out the importance of an effective policy framework with clear objectives, such as the Renewable Energy Directive(RED), to effectively support the development of the bioeconomy. Finally, Mr. Andrzej Schleser from the Polish State Forests presented the case for promoting the use of wood for the construction of housing. Although the use of wood in the construction industry provides many advantages, such as price, weight and strength ratio and fire safety, there are also barriers to the use of wood. One of the obstacles is the existing lack confidence in the fire-resistance of wood and the use of wood as a valid substitute material for reinforced concrete. To sum up, the cases which were presented and the subsequent discussions pointed out the continuous necessity to support research and development in order to find new innovative uses for wood. Furthermore, solutions are needed to eliminate, or at least reduce, bureaucratic burdens for primary producers. Boosting consumer use of wood supports the development of the bioeconomy. 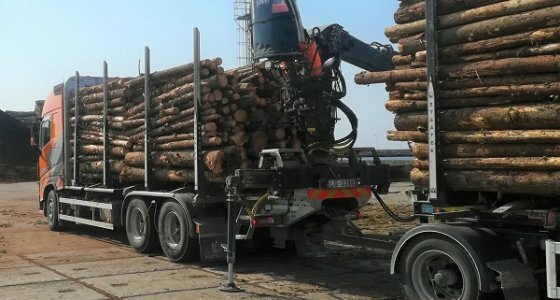 The European forest sector and sustainable forest management practices play an important part in the bioeconomy and, ultimately, in achieving Europe’s climate and sustainable development objectives, including those of the Paris Agreement. Please, find the report of the workshop recently published by the European Commission at the following link. The coordination group for Biodiversity and Nature were held in Brussels on 18thSeptember 2018. The main topics of discussion were the LIFE projects, funding, CAP and its impact on biodiversity, Biodiversity and Nature strategies, Green Infrastructure, Horizon Europe, Forest Strategy and EU initiation of pollination. Questions about available funds for biodiversity and environmental projects were raised, but the Commission argued that the final allocation of resources will be known when the Multiannual Financial Framework and CAP are decided. Already now it was known that, in the new CAP, 30% of supportmust be targeted towards nature conservation. Rural development funds under CAP come from public money and should be used for public goods such as biodiversity, environmental protection, etc. The new CAP will recognize an even greater variety of “greening” measures such as the minimal area to set-aside from production, banning the cutting of edges and trees around the fields, non-intervention during bird-breeding season, support to environmental and climate change related investments and young farmers as well as providing payments for Natura 2000 areas in agricultural land, similar to what is currently done for forests now. A modernized system under a new CAP should allow avoiding overlaps (double funding) between the two pillars, while offering more flexibility and less bureaucracy to MS. 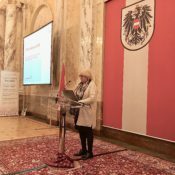 However, Germany claims that there is too much freedom for MS which could allow agriculture, as a strong sector, to use EU funds for measures which do not meet the environmental objectives of the EU and may cause negative effects to nature. The EU has committed to halt the decline of pollinators. A recent public consultation received more than 60 000 replies, out of which 90% reported alarming situations. As a first step, the Commission announced the gathering of information on insect pollinators in order to cover the existing gaps in knowledge. In a second step, the causes of decline will be tackled. The action will include identification of threatened species and habitats, both in rural and urban areas. The impact of pesticides must be evaluated and their application controlled. In a third and final step, the Commission will develop actions to raise the awareness and engagement of entrepreneurs and society in Member States. To accomplish the mentioned steps expert groups are needed, but finances for monitoring are under question. More information about this initiative is available here. The document “Informing strategic green infrastructure and restoration planning through mapping and assessment methods based on spatial and technical data” is under preparation by the European Commission. Following their public consultationthe Commission stated that it will consider all the comments and include them in the revised document. The next version of the document will appear at the end of 2018 or beginning of 2019. While discussing the implementation of the existing Biodiversity Strategy 2020 the CGBN experts called on making a stronger link to Sustainable Development Goals. Further work on the new strategy should be done based on a step-by-step approach, using non-technical language and reducing the possibilities of different interpretations. The revised Strategy must also build on an analysis of the causes of implementation failures of the current strategy and seek solutions for improvement. At the event, France presented its national biodiversity strategy action plan, which consists of 90 different actions, including those which support the bio-economy without causing harm to nature and/or biodiversity, halting the production of plastics, reducing light pollution and other measures to reduce the ecological footprint of economic development. and biodiversity ahead of the COP14 of the Convention on Biological Diversity to be held in Egypt in November 2018. Ministers expressed their deep concern that the natural resource base and ecosystem services that humanity depends upon are at high risk and that most pressures driving biodiversity loss continue to increase.